Utah Valley is living in the golden age of dot.coms, so maybe motorheads Tom and Dave Kirkham are throwbacks--bygone titans of a Detroit-style industry. 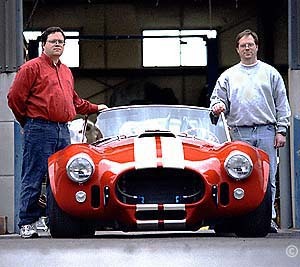 These brothers are hard at work in northwest Provo producing a better-than-perfect replica of the 427 Cobra, a sports car legend from the' 60s, and selling them to the likes of oil-rich Arab sheiks, millionaire computer geeks or anyone else with gold in their pocket to spend on this incredibly popular sports car. The original American 427 Cobra was born in the '60s when Carroll Shelby shoehorned a Ford V-8 engine into a small British car body, calling it his Cobra. It took the thunderstruck motoring world by storm. Not just any snake in the grass, Shelby's 427 Cobra redlined at a screaming 7,000 rpm, and its 500 horses rocketed the monster to 60 mph in a slim 3.5 seconds. Top speed was more than 150 mph. 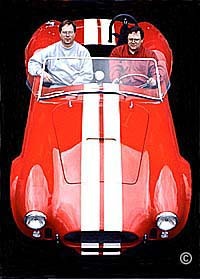 As powerful as it was, the two-seater roadster was also an undisputable beauty. Only 348 Cobras were made. But then a plethora of manufacturers began making replicas, mostly of fiberglass. But until the Kirkhams started making their 427, it was always way too easy for a replica driver to tell the difference between it and the original. "Lots of manufacturers produce replicas of varying quality and price," says Tom Kirkham. "But we provide the one ingredient no other American manufacturer is offering -an aluminum body just like the original car but better." The amazing brothers Kirkham actually produce their aluminum body in an aircraft factory near Warsaw, Poland, that once produced fighter jets during the Cold war. Components are then added in Provo. "Our guys in Poland built a defense system that had our military nervous for 30 years," says David Kirkham. The handmade original bodies that Shelby got from British metal workers were imperfectly thicker on one side than the other, but Tom says that unevenness is now gone thanks to computer design and their skilled workers. Not cheap, a basic Kirkham 427 will set you back $60,000. And that's with no engine, transmission or paint. Owners add the engine and the rest. Then they claim the car drives and feels just like the original. By now their car is the color they want and as powerful as they dare and they've laid out about $100,000. So what do they have to show for it? They have a car with no spare tire. There isn't any room. They don't have a rain top or radio. But that's OK. Owners want to listen to the throb of their 427, not some punk rock band. There's also no heater and no outside door handles. But they don't care -it's prettier and quicker than their imaginations and a legend to boot. Writer and photographer Pat Christian lives in Utah, specializing in assignments in The Beehive State and San Francisco. E-mail him at pat@patchristian.com .